Wish you could learn and memorize more in less time? Stay focused, quit being frustrated, and absorb info like a human sponge? If you're looking to (1) accelerate your learning abilities, (2) improve your memory instantly, (3) pick up new skills efficiently, and (4) fly through material and ace tests - the answers are right in front of you. Step-by-step methods and habits to train your brain. 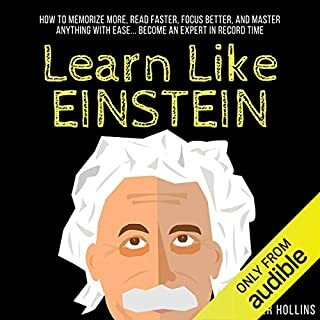 Learn Like Einstein is your scientifically proven field guide on using your brain to its fullest potential like Albert Einstein. Do you wish you could read a 200+ page book in a day, remember 80% of what you learn, or keep your attention on an activity for hours at a time, no matter how difficult and boring? Most people assume these skills are for the mentally gifted or those who go through a rigorous academic training. The truth is, faster reading, stronger memory, and higher concentration are within your reach. In fact, you already have this ability, you're just not using the correct approach. Narrated by: John Alan Martinson Jr.
Want to walk into office for that crucial presentation confidently and deliver your speech without reading off your script? How about doing well for that test without having sleepless nights? Or remembering significant dates and events without being awkwardly reminded by someone else? In Memory Exercises Now, you will be shown in a series of simple and easy step-by-step techniques to improve your memory and become more productive and efficient - both in life and at work. A Quick-Start Guide to Mastering Your Attention, Ignoring Distractions, and Getting More Done in Less Time! Imagine having more free time to spend with your friends and loved ones. Imagine having the freedom to pursue things you're passionate about, whether it's gardening, hiking, reading, or restoring a classic car. 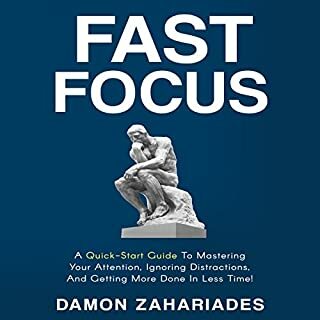 Amazon best-selling author Damon Zahariades takes you through a proven system that'll help you to master your attention, keep distractions at bay, and get more done in less time. Want to learn a skill, but don't know how to get started? Struggle to find time for a side project? Ever quit in frustration after beginning something new? The truth is: You can learn anything...without spending lots of money...without dedicating thousands of hours to the process...and often without leaving the comfort of your home. How to learn effectively when you have to be both the teacher and student. Work smarter and save yourself countless hours. Self-learning is not just about performing better in the classroom or the office. It’s about being able to aim your life in whatever direction you choose and conquering the obstacles in front of you. This is a comprehensive guide to learning about a wonderful technique called mind maps. Mind maps are an amazing organizational and creativity tool that can improve memory, concentration, communication, organization, creativity, and time management. Have you ever walked into a room and couldn't remember what you went there for? Have you ever grasped the hand of a potential client and then when the handshake broke, the name seemed to disappear from your memory? Or have you ever left a prospect or an important meeting and as you drove away remembered a key point that you should have shared with them? The problem is NOT with your memory. The problem is with the "Filing System" your brain currently uses to store and retrieve memory items. Still wondering how some people can remember information in great detail? 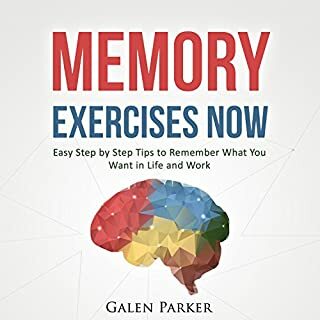 In Photographic Memory, you won't just learn about the concept of photographic memory, but you'll also discover the secret to expanding your retention capacity. Learn more about how your memory works and what makes a person remember things clearly. 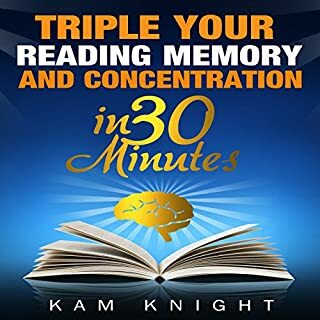 If you are one of those people who still memorize things through repeating them over and over until retained, then it's time to get rid of that old habit and discover a range of various memory tricks and techniques in this book. Do you want to save hours a day and do more in less time? Feel productive instead of stressed, defeated, and overwhelmed? If (1) you wonder where your time goes, (2) you can't motivate or organize yourself, and (3) you struggle to buckle down and concentrate when it really matters - newsflash! Your to-do list is not cutting it anymore. You need to develop superhuman focus and all that comes with it. Superhuman Focus teaches the most important of skills - the ability to get stuff done. Learning is the key to bettering your circumstances and becoming the person you want to be. 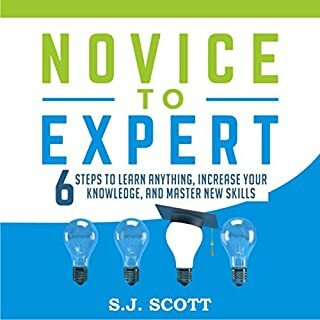 Skills, information, and abilities will never come to you - it’s up to you to seek them out, and this audiobook shows you how to do so in the most effective and efficient manner. Jump-start your reading skills! Speed reading used to require months of training. Now you can rev up your reading in just a few minutes a day. With quizzes to determine your present reading level and exercises to introduce new skills quickly, 10 Days to Faster Reading will improve your reading comprehension and speed. A Stress-Free Guide to Creating To-Do Lists That Work! Finally! Discover how to create to-do lists that work! Do you feel frustrated because you can't seem to finish every item on your daily to-do lists? Do you feel discouraged because you're not effectively managing your workload and responsibilities at your office and home? The good news is that there's a simple solution. It's a matter of using an approach specifically designed to help you organize, manage, and address every task and responsibility on your plate in a timely fashion. Are you overwhelmed with information and paralyzed by pressure? Constantly missing opportunities because your intuition is wrong? You can't just rely on your gut instinct or "hunch" when you make decisions. There's a science to improving your critical thinking, weighing pros and cons, and avoiding the traps that take you down the wrong path. We can systematically make decisions that will improve our lives if we just know what to focus on. Learn why most of our instincts about decisions are flat-out wrong. Terrified of making bad decisions and missing great opportunities? Do you question your judgment and doubt your intuition? Your brain is like any other muscle: it needs training to improve. Nobody is born with flawless critical thinking and judgment skills. These skills usually require systematic practice, but you can shortcut the learning curve by learning and mastering the methods of the best thinkers, psychologists, and high achievers. Finish What You Start is a unique deep dive into the psychology and science of accomplishment, productivity, and getting things done. It takes a thorough look at why we are sometimes stuck and gives detailed, step-by-step solutions you can start using today. Every phase of finishing and following through is covered, and even productivity pros will be able to learn something new. Above all else, this is a guide to better understanding your brain and instincts for optimal results. Mind mapping is a note-taking system which allows you to take better, faster, and more efficient notes. In conventional note-taking, you write down information line by line. With mind maps, you organize the information more in the form of a diagram, starting with a central key idea drawn in the center of the paper. In addition to enhancing your note taking skills, mind maps help you improve your studying, writing, presenting, brainstorming, and creative skills. It is one of the best note-taking skills anyone can learn. even if you don't care for mind mapping, you can learn a lot about good studying, note-taking, writing, brainstorming, decision making habits. They should really teach mind mapping in school. As someone who's struggled with learning disability, mind mapping has helped me tremendously. I can't say enough good things about it. for someone who has never heard of mind maps or mind mapping before, i found it very helpful to get started. I didn't think I could learn much about mind mapping by listening to an audio lesson but I am surprised, pleasantly surprised. With the audio reference, the material is presented in a way that is both simple and easy to follow and understand. I've now got some new tools in my arsenal which I'm excited to apply. If you notice, there aren't really any audio books on mind maps (as of this review). That’s inherently because mind maps are graphic and visual in nature, so it is hard to convey what mind maps are, why they are useful, and how to put them to use in an audio book. Nonetheless, this author has managed to do a superb job presenting the topic of mind maps and mind mapping. And he does it in a way that is very simple, intuitive, and easy to follow along, even on audio. 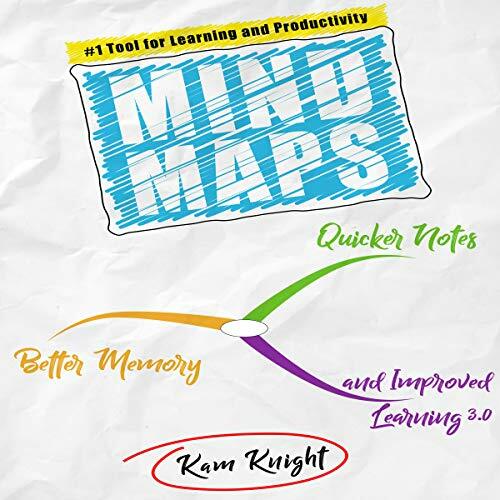 The voice of narrator is also great, he has a very engaging and inviting tone that makes listening to the learning about mind maps fun and enjoyable. No doubt one of my favorite audio programs. Would you listen to Mind Maps again? Why? Definitely, this was a very informative book with lots of impressive mind mapping ideas, it far exceeded my expectations. What was one of the most memorable moments of Mind Maps? The section on "Recall," to use Mind Maps to trace information you've forgotten. The concept blew me away, I can see how Mind Mapping is a unique tool that can be used in this area. Have you listened to any of Jeremy Vore’s other performances before? How does this one compare? Haven't listed to the narrator's other performances, but his narration was excellent. What did you learn from Mind Maps that you would use in your daily life? Most everything in the book can be applied in daily life and the author does a wonderful job showing you how. I can see why this is one of the best books on mind mapping. It's a very well put together, easy to understand, and fun to learn manual. You'll not only discover all the benefits of mind maps, but their limitless applications from studying, writing, and brainstorming to planning, project management, and even learning a foreign language. You can't go wrong with this audible book, just download the supplementary pdf to follow along with the speaker and you're set. Very good presentation of what is mind map and how to apply it to different concepts with practical examples. In addition the narrative by Jeremy Vore creates ambiance for more attentive listening. Great intro to a great tool. I listened to this without the accompanying book, and I still found it quite helpful. I got a little bogged down during a section on conjugating Spanish verbs to show how one might use mind maps when acquiring a new language. I would likely need to listen to that section more than once and really focus on it if I were to be able to gain the full benefit of the method for this particular application. That said, I think it would be well worth my time to study this section when I tackle my next foreign language. The narrator was excellent and the content was well organized. not much to say, this is one of the more professional audio productions I've listened to. the content was delivered in a very clear and understandable way. the illustrations too seemed of high standards.